The Integrated Service Delivery (ISD) Project, jointly implemented by the Governance and Leadership Program of the TSRA and the Queensland Department of Aboriginal and Torres Strait Islander and Multicultural Affairs (DATSIMA), established Regional Plan Working Groups (RPWG) in 2009 comprising representatives of the three levels of government (agencies working in the Region). In 2011 the RPWG completed the mapping of all government services being delivered to Torres Strait and Northern Peninsula Area Communities. This exercise also identified gaps to be addressed. 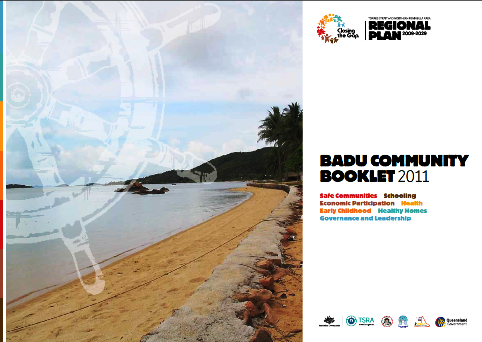 This service delivery mapping was then compared to the list of community needs and aspirations that were collected during the 2008 consultations that produced the Torres Strait and Northern Peninsula Area Regional Plan 2009 - 2029. To act as a basis for discussion between community members and motivational or rallying tool for communities. New issues being added (new red items). Items for the different levels of government. Some of the red and orange items are being included in a single document called the ISD Action Plan. The TSRA is currently working with Australian and Queensland Goverment agencies to develop this bi-lateral ISD Action Plan, which will comprise a list of actions to address the remaining shortfalls in service delivery that are the responsibility of the two levels of government. It will act as a 'blueprint' for the Region and be a 'live' document, that is, it will be continously updated as actions are completed or circumstances change.